Build followers, get more sales. The simple strategies for artists to help painlessly increase Instagram presence and find fans and collectors. 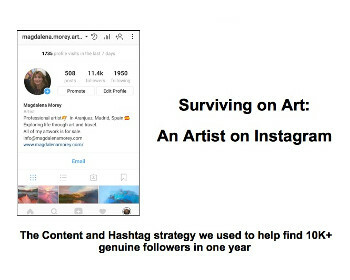 Surviving on Art - An Artist on Instagram explains in detail how internationally exhibited contemporary artist Magdalena Morey went from less than 100 to over 10,000 followers in less than one year without resorting to buying followers or spending hours hunting for reciprocal likes and follows, resulting in a massive increase in direct and indirect sales.